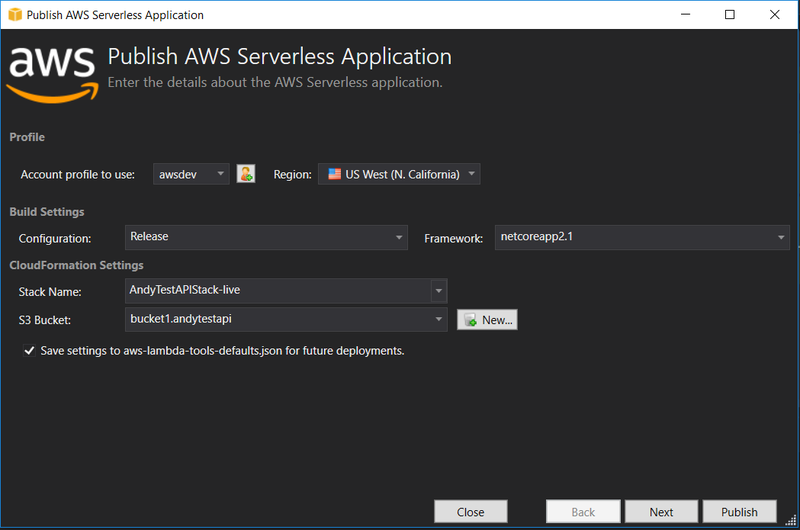 So here we’ll look at deploying a Web API on Lambda & S3. First we’ll look at the guide Amazon provide, and then we will look at things in a bit more detail and tackle the questions left unanswered. *You can convert an existing project also. I’ll do a follow-up on how this works soon. So… all done, right? That was easy! Well… not quite. What if your web API needs to communicate with RDS? What if it needs to talk to other external services & APIs? Can you still use Nlog and Swagger? How do you publish to separate staging and production environments? All these answers and more can be found below. So, I create an ASP.NET Core Web API from the project menu, call it ‘AndyTestAPI’, and modify the controller to add my test methods. The exact code isn’t important here (in a production environment for example, you’re more likely to use Entity Framework than direct SQL queries), but the point is I’ve added three methods — one for a simple GET request, one which checks connectivity to an external location (www.google.com) and one which performs a query on a database I set up in AWS RDS earlier. Damn. So now I update my copy of visual studio, then I install the latest copy of the .NET Core SDK, and try again. All good. Note that in order for the database connection to work whilst developing on my local machine, the security group on my AWS RDS instance has been set to allow access only from my specific IP address. You’ll need to set up an AWS user account in IAM with programmatic access. Mine is called ‘awsdev’. As expected, the RDS connection fails because the security group is currently blocking all incoming traffic from unrecognised sources. 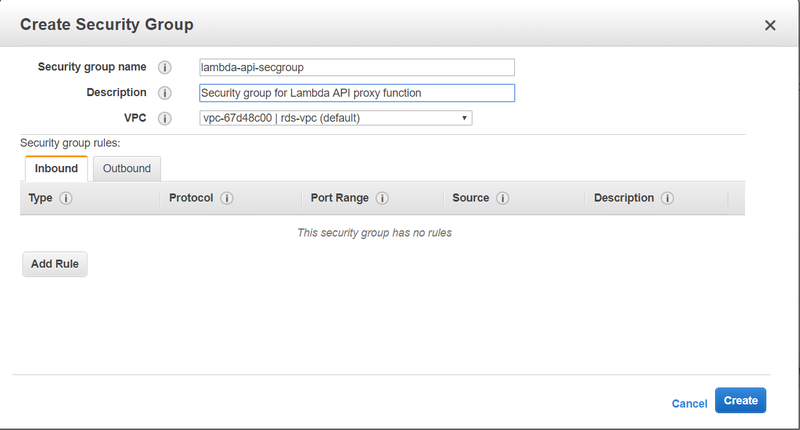 Now you can update your lambda VPC settings, followed by your RDS security group. OH GOD! GOOGLE IS DOWN! Or…. wait, what was that warning about external access from our lambda function if we make it run in a VPC? Now we will create some new subnets to sit within our VPC. Assign these whatever IP range is suitable for your setup. Now create a new route table in your VPC, and add the 0.0.0.0/0 route to it, pointing to your NAT Gateway created earlier. Now we run the test functions again, and everything works! Hurrah! 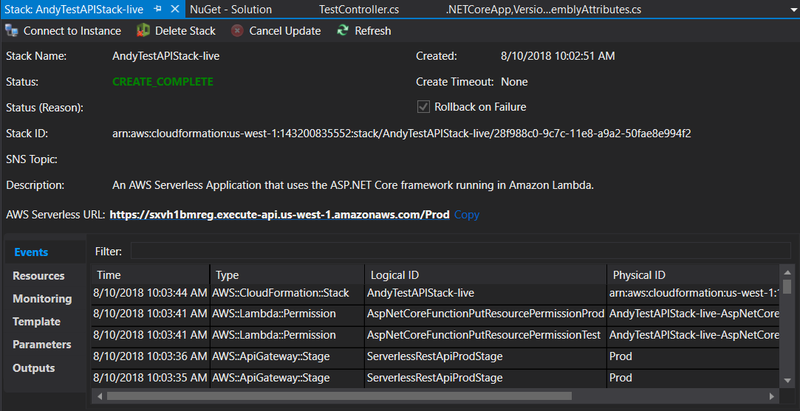 We now have an ASP.NET Core Web API deployed to AWS Lambda using S3, and it is able to both make external connections and query databases we’ve set up on RDS.